At a gallery exhibition of my photographs in Hartford, CT, I met a Certified Zentangle Teachertm whose description of the art form intrigued me. A few months later I attended a four-day Zentangle Teacher certification training led by Zentangle co-creators Rick Roberts and Maria Thomas. They developed the method by combining Rick’s previous experience of living as monk for 17 years with Maria’s professional talents as an internationally sought after lettering and calligraphic artist. "Our Zentangle method is a way of creating beautiful images from repetitive patterns. It is fun and relaxing. Almost anyone can use it to create beautiful images. It increases focus and creativity, provides artistic satisfaction along with an increased sense of personal well-being. The Zentangle method is enjoyed all over this world across a wide range of skills, interests and ages. We believe that life is an art form and that our Zentangle method is an elegant metaphor for deliberate artistry in life (Roberts & Thomas, 2012)." At the training and during subsequent conversations, Rick and Maria shared numerous anecdotes describing the positive affect of the Zentangle method on individuals and their lives. They spoke of students gaining clarity and calm before taking standardized tests, of how children that focus on drawing Zentangle patterns no longer cry while receiving chemotherapy and of individuals being empowered by seeing themselves as artists for the first time. 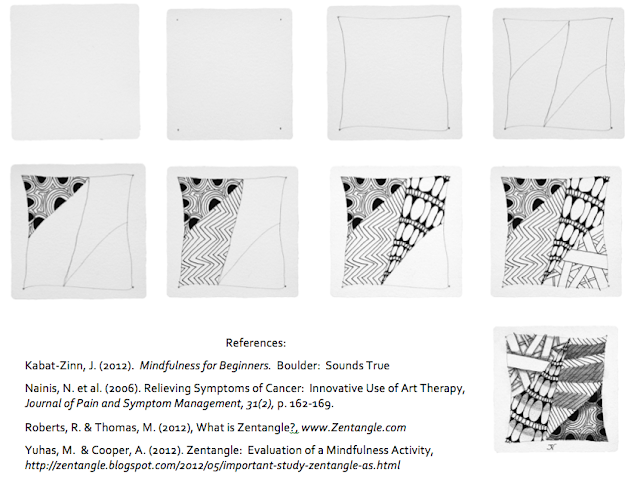 Once certified, I had access to the various Certified Zentangle Teacher (CZT) online forums, where I discovered that a CZT had posted a research study noting the positive effect of art therapy on cancer patients. A research team led by Nancy Nainis discovered that a one-hour art making session guided by an art therapist reduced both physical discomfort and anxiety (Nainis et al., 2006). 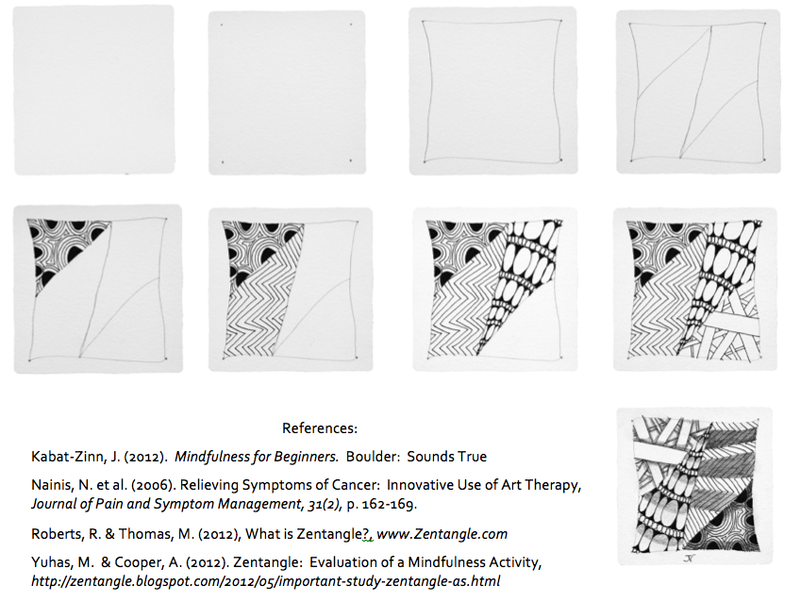 The study motivated me to design and implement a study to assess the correlation between participating in Zentangle class and well-being. I wondered if data would validate Rick and Maria’s anecdotes. I ultimately made arrangements to conduct my research with three different cohorts: individuals affected by cancer, senior citizens and members of Narcotics Anonymous, a 12 Step Program for individuals recovering from addictions. In the study of cancer patients that set my project in motion, Nancy Nainis’s team used the Edmonton Symptom Assessment Scale (ESAS) to assess physical discomfort and the Spielberger State Trait Anxiety Index (STAI) to measure anxiety (Nainis et al., 2006). I followed Nainis’s lead by using the STAI to measure participants’ pre-class anxiety levels and their post-class anxiety levels. Unlike the Nainis study, where the art therapist had a cart packed with a variety of art supplies and participants chose their materials, I used mostly standardized materials (see below) and a written lesson plan, endeavoring to deliver the same experience to each cohort. Participants drew on 3.5-inch squares of fine Italian made paper referred to as “tiles”. 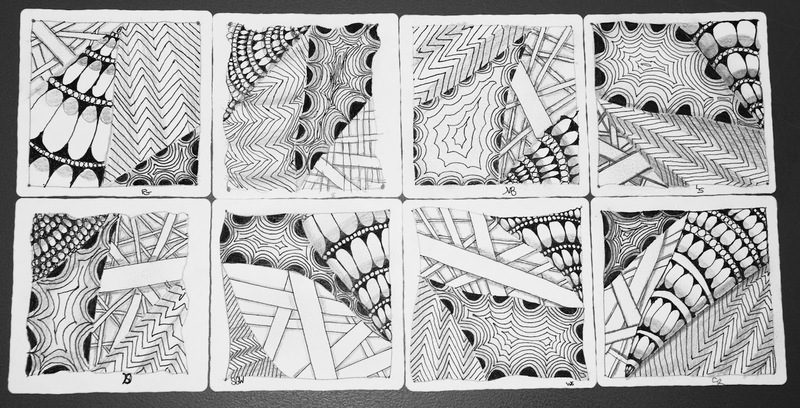 (At the end of a Zentangle class, students form a group mosaic with their drawings; hence the term “tile”). The participants used fine-tipped Sakura pigment pens and Zentangle pencils, except for the senior citizens who used a slightly wider bodied pen for easier gripping. I used a video document camera to project the small tiles in large format on a screen so that I could clearly demonstrate the simple, structured patterns that combine to form a complex Zentangle image. Cohort Two: Senior Citizens. I taught this class in the art room at a town run Council on Aging Senior Center. I gathered that some of the seniors had met before, but not all. There were 7 females, ages 60-83. 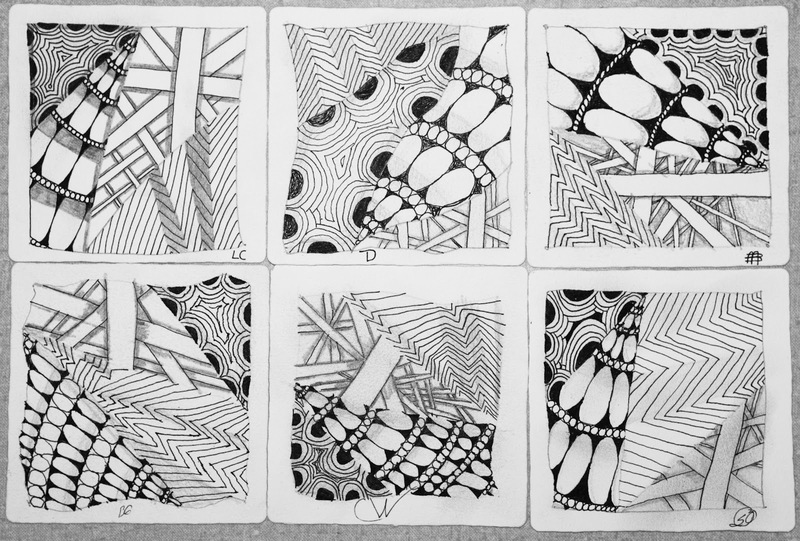 It was the first time the participants had tried the Zentangle method. Below: works of art created by Cohort Two. Cohort Three: Individuals Affected by Cancer. I taught this class at non-profit community-based center that supports people with cancer, their families and caregivers. I believe that most of the participants regularly meet to knit and support each other. Participant responses on the center’s evaluation forms of my class indicated that 6 of the 8 women have cancer diagnoses. Age range: 19-68. 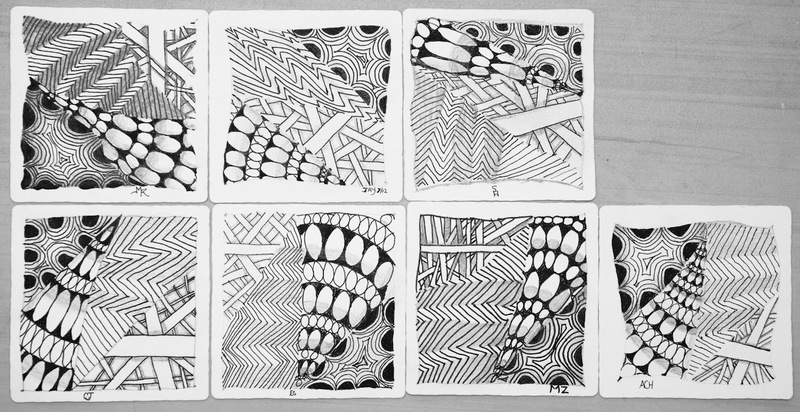 It was the first time the participants had tried the Zentangle method. Below: works of art created by Cohort Three. I carried out this research project to create an Arts Presentation for my Masters of Education in Arts Education at Fitchburg State University in Fitchburg, MA. Given the relatively small number of participants, the non-standardized environments, and the lack of a control group or an oversight committee monitoring my methods and approach, the results must be viewed with a critical eye. 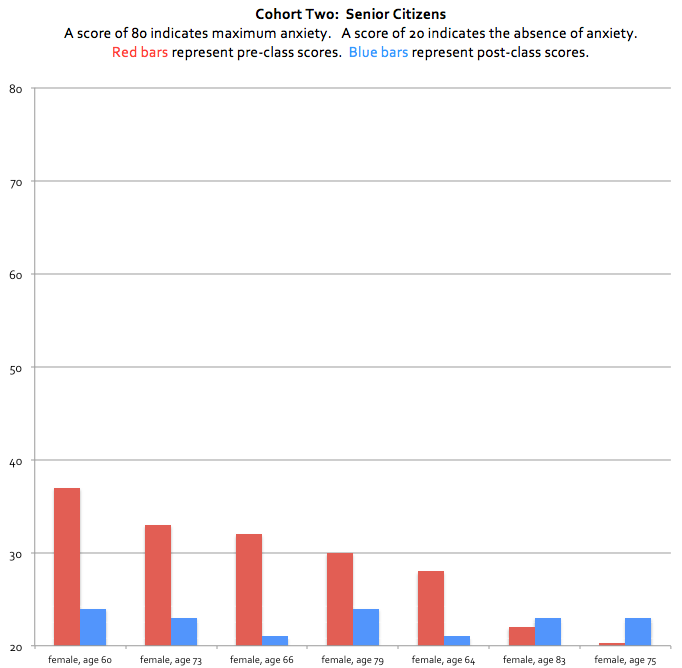 That being said, the anxiety scores for 16 of the 21 participants decreased. 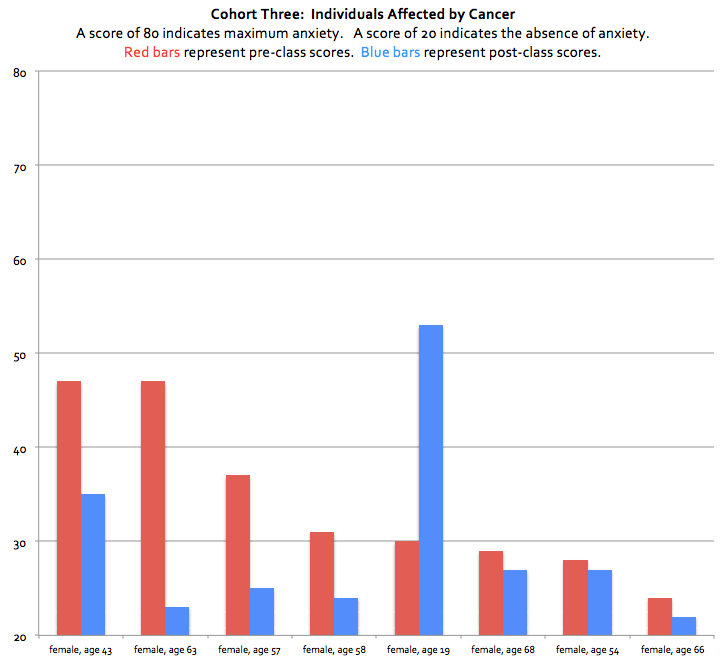 The anxiety scores for 2 of the participants remained the same and the anxiety scores for 3 of the participants increased. 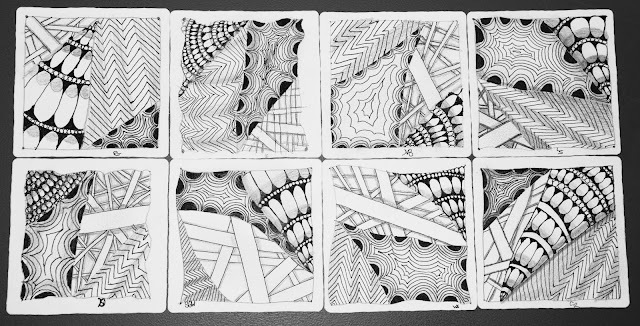 Since the anxiety scores decreased for 76 percent of the participants, one can conjecture that participating in a Zentangle class reduces anxiety for some individuals, thereby increasing their well-being. 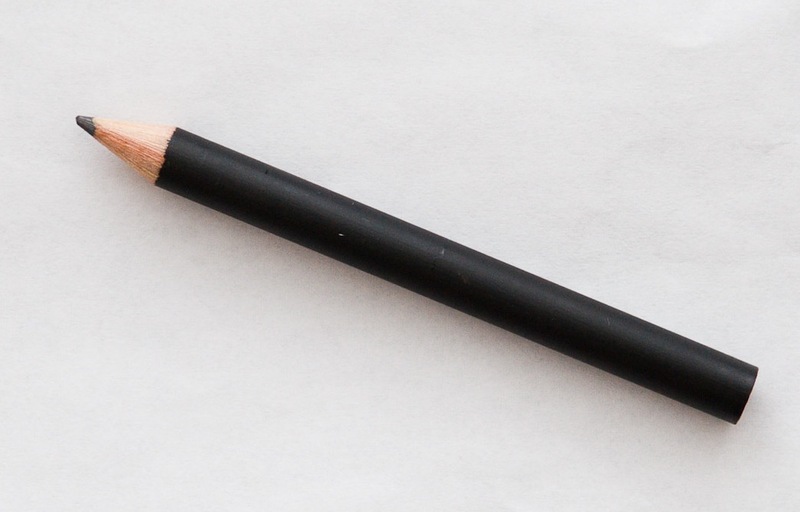 Postscript: The Zentangle pencil shown here is used for shading the pen-drawn patterns or “tangles”. Please note that it does not have an eraser. In the Zentangle mindset there are no “mistakes”, only unintended or unexpected occurrences. Such events can be the basis of discovering something new. 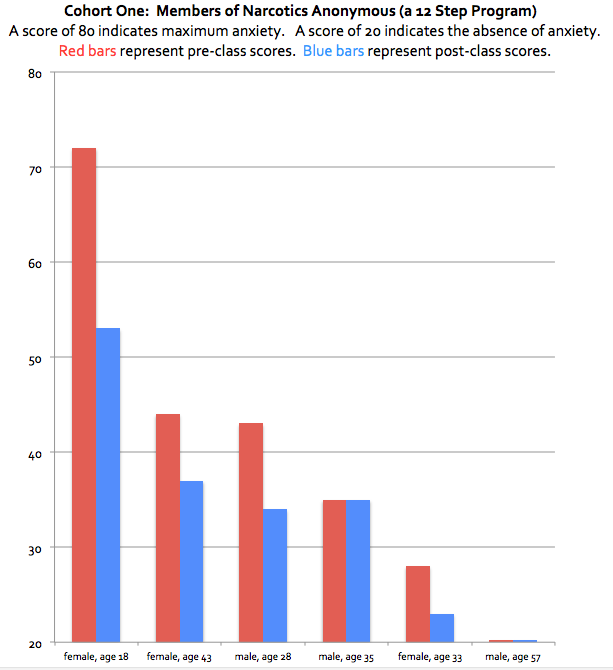 Fascinating study. Thank you for sharing. What inspires is the world I live in and the "space" surrounding daily life impressions, particularly those impressions found in nature. Diana, thank you for your insights. Yes, the vast inspirational force of nature. The movement of light across places is one of my favorites. Well done. A good reference to send people to.